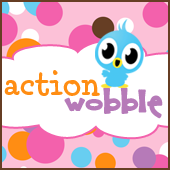 Action Wobbles: Wobble Wednesday Challenge - Anything Goes! Head on over to the Action Wobbles Challenge Blog to enter this week's challenge. Great card and another fun challenge. Thank you so much for the honor of being your winner this week. This is so cute. I just like all the characters from that movie.Gonna join this fun challenge. Thank you.